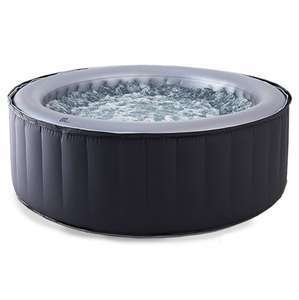 https://www.studio.co.uk/shop/en/studio/aqua-spa?source=TK1S&amp;cssoc=047&amp;gclid=CjwKCAjwzPXlBRAjEiwAj_XTEdJZRmGIzXgoagXdguT11e3uwxnDzOeam5KHgo2W4cudEbPJjR7wehoC1Z0QAvD_BwE There's an alternative, rectangular one with excellent reviews if you can't find stock of this. Nope. I got a chargeback through my bank and then received a further refund from the 'company' so I picked one up from my local tesco. Hi Craig, did it arrive OK? Jeez! (shock) Mine went up by about £15 per month last summer. Packed it away in October (apart from using it over Xmas period) and back up again now. Very happy with my Tekapo 6 person version. I have a tub from Blue Whale Spa, almost 2 years old. The tub itself is great and still going strong. Their customer service throughout the delivery process though was awful, cancelling appointments, making up excuses etc. Since then though, they've been absolutely fine. I have one but American made. Chinese made are usually 2 piece and joined in the middle - prone to leaks. Mine is fine in winter with good insulated cover and set heater to holiday setting to reduce energy costs. 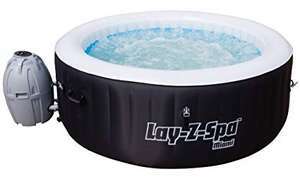 Never miss a 'Hot Tub' deal again! Don't freeze in Scotland in December even in a hot tub.You can use tesco vouchers. Also rail card or nhs for 10-15% discount without this palava too.The deal. @vicki.forrester no code was needed at the time of posting, price has since gone up so i've expired this deal. this shows as £300 when you go to pay,. is there a code? Had one of these and had to skip it after a couple of summers' use as the pump went bust. Replaced it with an Intex one from Aldi and the difference in quality and attention to detail in the design is amazing. Never mind...saw the pic and thought it was of a very expensive ultrasonic cleaner!! 4 people ? kneeling i assume? 10% off the entire site at All round fun. 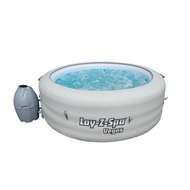 Got a inflatable spa here myself a while ago, great purchase and a good company to order off. Plenty of Christmas ideas on the site. How old was it when the motor went? I don't like chlorine, I'd be inclined to use Epsom salts and just change the water every few weeks. They stated it was a build up from the chemicals used if I remember correctly. They repaired the motor but at folks expense. That was the reason I chased for details on what chemicals to use but they were not forth coming, the email above was the last in a series of emails of me pushing them but all followed the same pattern of avoiding giving specific details, it started by me asking what to use as they they had no list for sale on their own site, then they added a page later but has been out of stock since added. So based on listing you should use chlorine granules. Did they say how they determined it was chemical damage? If it's under warranty then you should insist they sort it, you could actually argue it's not fit for purpose if it can't handle chemicals that are necessary for it's use. Did anybody succeed setting up? You forgot to add the Sewerage charge at £3.41, so more like £5 a time to fill up. Damn (lol) Thought the same thing and loaded up this thread thinking "wow this is top comment worthy humour." Alas, it has already been thunk. Many thanks... what make/model do you have? Were finding it's pretty damn near £1/day, something about the same size. we struggled with that, think it might be easier once its full as it has no where to drop down.edit: yup, with the pool full its wel easy to put the cover on. need a solar one though as its freezeing.As for steps, i recommend getting those small plastic square block type steps (like kids use for toilet training) two of those, one in and one out. its easier than those up and over ladders which are as flimsey as anything. Hiya do you know if there are any left please? The Vegas is supposed to be for 4 but would suit 2. Was waiting for a good deal on the St Moritz, but at this price I'm willing to take a slight downgrade. Heat!